The ideation finally found a worthy digital label, an anchor, a domain name. 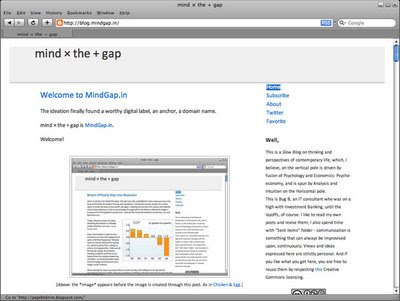 mind × the + gap claims MindGap.in. Finally domain is urs,great idea. Like this layout as find it more clean,simple and makes it elegant. Well, yeah.. I have been on a lookout for something worth investing into - digitally speaking.